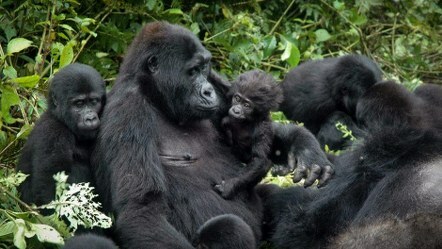 The 18 days Uganda safari incorporates gorillas, Chimpanzees, culture, wildlife and scenery. It includes encountering the heritage of Kampala city, adventures of River Nile, Rhinos in Ziwa sanctuary, wild game of Murchison and Queen Elizabeth including giraffes, lions, elephants, buffaloes and antelopes, Sempaya hot springs of Semuliki, relaxing boat cruise on Nile River, Kazinga channel, Lake Bunyonyi and Lake Mburo, climbing Virunga ranges, scenic views of crater lakes and Amabere g’ Nnyinamwiru caves, Chimpanzees of Kyambura, gorilla trekking in Bwindi, Batwa heritage in Mgahinga and horseback safaris in Lake Mburo National Park. 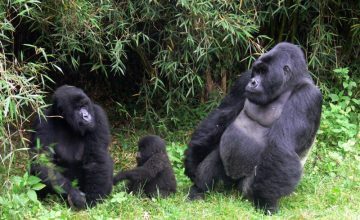 Day 13 of the 18 Days Gorilla Trekking Safari & Wildlife: Do Volcano climbing or do golden monkey tracking. 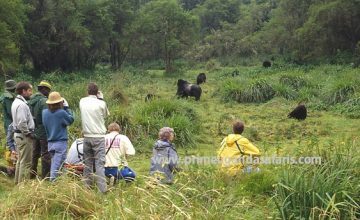 Day 18 of the 18 Days Gorilla Trekking Safari & Wildlife: Do Nature walk & transfer to Kampala. 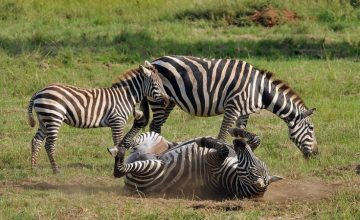 The first day of this 18 day safari is designated for your arrival in Uganda. It is such a wonderful initiative when you pack your few necessities and set off for a safari in Uganda. You will arrive at the Entebbe International Airport which is the main gateway to the country where you will be welcomed by our friendly guide who will transfer you to your respective hotel for relaxation from the aero toxic syndrome and eventually an overnight. Kampala city is a destination of its self and thus worth to encounter on Uganda safari. The city is a hub of various attractions ranging from historical to cultural and religious attractions. On this 11 days safari in Uganda, you will wake for breakfast after which you will set off with the company guide to encounter the city. You will visit religious attractions like Namirembe and Rubaga Cathedrals, Baha’i temple, Gadhafi Mosque, Cultural attractions like Kasubi tombs, Kabaka’s palace and Kabaka’s Lake, historical monuments and museums like the Uganda National Museum, National buildings like the parliament, educational Institutions like Makerere University, Traditional hospitals like Mulago hospital, Mengo and Nsambya hospitals. However, since all these cannot be seen on a single day, you will thus select from this list the possible attractions that you can visit on this day. You will wake up early for breakfast at your place of stay after which you will be transferred by your guide to Jinja 80km about 1-2 hours’ drive from Kampala. 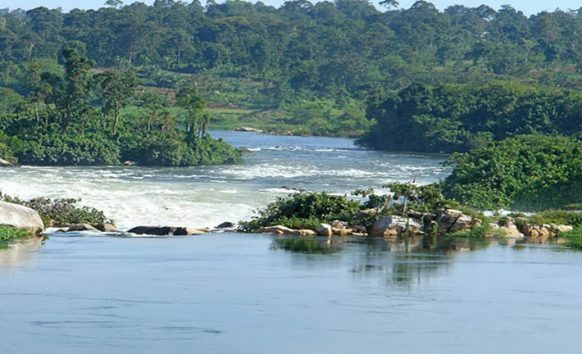 Upon reaching Jinja – the adventure town of Uganda, you will enroll yourself for the white water rafting experience that will see you contain the strength of waters of the Nile as they splash through the rapids. You will also participate in the bungee jumping that will see you fall from the cliff to touch on the waters of the Nile 140ft below – one of the active adventures you will ever have. The relaxing boat cruise to the source of the Nile will take you to the point where John Speke, the first European to see the source of the world’s longest river stood. You will see the Nile starting it 90 days journey to the Mediterranean Sea. Drive back to Kampala for overnight. The drive to Fort portal is not an ordinary journey; it involves driving through the lush country side dotted by amazing features of earth movements including the Albertine rift valley. The farmed landscapes bring out the typical African villages that you have always heard of or wished to see on your safari like this safari in Uganda. Fort Portal is 415km about 8 – 9 hours’ drive from Murchison Falls National Park. The lunch stop will be made in Hoima town dubbed the oil city and continuous drive will see you arrive in Fort Portal in the evening overlooking the mystical Ruwenzori Mountains famously known as the mountains of the moon. Accommodation: Kyaninga lodge (Upmarket/Luxury), Mountains of the moon hotel (Midrange/standard) or Rwenzori guesthouse (Budget/Basic). After breakfast, drive for 52km about 2 hours to Semuliki National Park for an amazing nature walk. You will pass through this forest of Semuliki which shares much of the characteristics with West African forests. 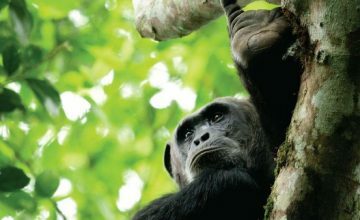 It is a continuation of the Congo Ituri forest. The walk will expose to various birds like Rwenzori Turaco and primates including the rare deBrazza’s monkey before reaching the famous Sempaya hot springs. 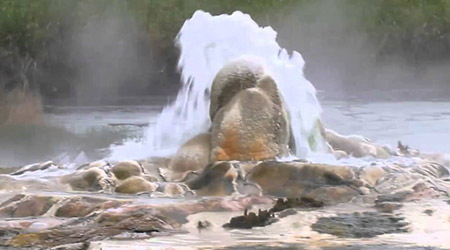 You will visit the female hot spring known as Nyasimbi and male hot spring known as Bitente where you will boil your plantains in this natural steam and they are ready in a couple of minutes – something to wonder of while on safari in Uganda. This is an eco-encounter that will bring you in close contact with nature and will ultimately refresh your body from the routine work back at home. Return to Fort Portal for relaxation and overnight. After breakfast drive to the Crater Lakes area to do hiking and Amabere caves walk. You will first visit the Amabere g’ Nnyinamwiru caves an ancient landmark with a lot of historical and cultural significance to the local people as it dates from the Chwezi era. 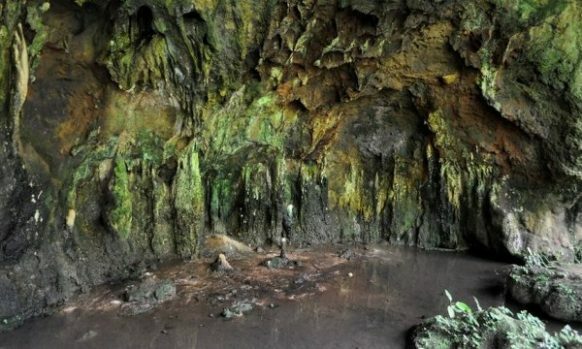 Geographically, the caves are breast like features of stalagmites and stalactites with the seasonal Nyakasura water falls falling from their roof top. 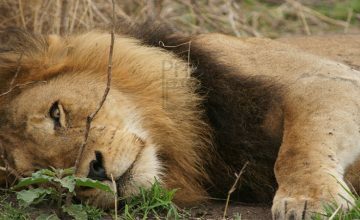 It is a great sight to encounter on Uganda safari. Continue to hike the crater lakes by hiking the famous Kyeganywa hill to gain the surrounding view of various crater lakes and hollows plus the overlooking views of Ruwenzori Mountains. In the evening, you can visit the Karambi royal tombs and the grand Karuzika Palace – the royal palace of the Kingdom of Tooro. Retreat for overnight. After breakfast, embark on the transfer to Queen Elizabeth National Park 144km about 3 – 4 hours’ drive from Fort Portal. You will enjoy the sights of Rwenzori Mountains en route before arriving in Queen early for relaxation and lunch. After lunch, you will gather at Mweya for the Kazinga channel launch cruise that sets off at 3pm taking 2hours. The thrilling boat exposes you to countless wild game drinking on the channel side including; elephants, buffaloes and antelopes while the sights of aquatics like Hippos and Nile crocodiles might not be missed. The birds over 60 species roam on the channel shores. Retreat for dinner and overnight. Wake up very for a cup of coffee before setting of for the game drive activity in the savannah game park of Queen Elizabeth. The early departure at 06:00 gives you an opportunity to see night hunters like hynas getting back to their hiding places and early risers setting off to look for what to eat. The drive through the Kasenyi tracks gives a probable opportunity to see a range of game including; Lions, buffalo, elephants, elusive leopard (if too lucky), antelopes among other wildlife. Return to the lodge after this 3 -4 hour game drive for a short relaxation after which you will transfer to Kyambura for Chimpanzee trekking. Trekking Chimps in Kyambura is one the challenging and yet rewarding activities that you can have on Uganda safari. It involves descending down to the valley with great views of the flowing Kyambura River and the passing through forested landscapes in search of chimps. 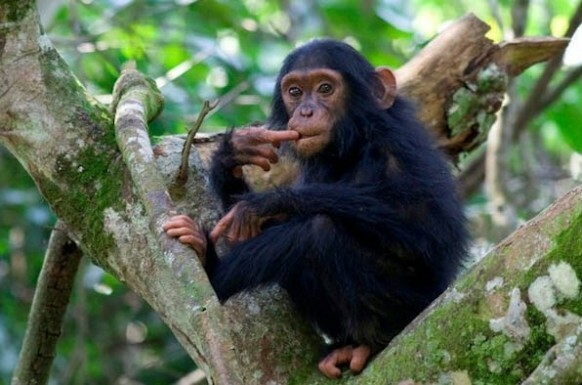 The steep ascend involved also spices your chimpanzee trekking experience in Kyambura gorge. Return to the lodge for overnight. Accommodation: You will have dinner & overnight at your previous lodge. 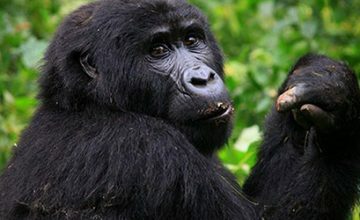 After breakfast, embark on the transfer to the gorilla trekking haven of Bwindi (Rushaga) 309km about 7 – 8 hours’ drive from Mweya. You will pass through the Ishasha sector of Queen Elizabeth National Park where you have chances of spotting tree climbing lions lying on tree branches in the midmorning warm sunshine. You will have lunch en route and proceed to Bwindi south (Rushaga) where you will arrive in the evening for overnight. Accommodation: Chameleon hill (Upmarket/luxury), Gorilla Valley Lodge (Midrange/standard) or Wagtail eco safari Camp (Budget/Basic). 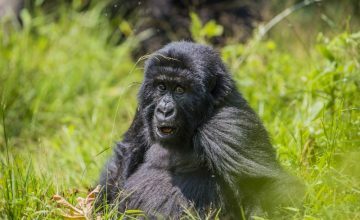 It is this long waited date when you will come across the critically endangered mountain gorillas that only exist in Bwindi and Virunga Volcanoes. 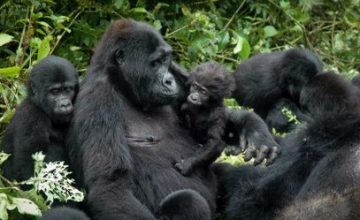 You will wake up early for a heavy breakfast before gathering at the Park headquarters Buhoma for briefing at 08:00 about the conduct of gorilla trekking. 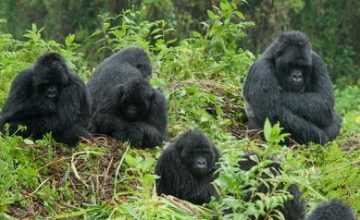 You will head to the forest after briefing in search of these apes and though the trek is a bit challenging, it is one of those activities that you will never forget to have done in Uganda. 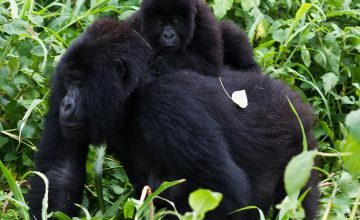 The 2 – 8 hours activity involves hiking up the hills, descending down the valleys, walking through swamps and maneuvering the way through thickets which have formed the background of this Impenetrable forest before coming in direct contact with gorillas. 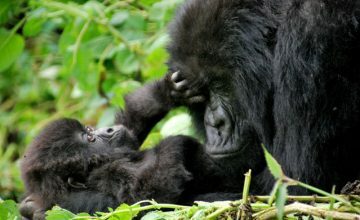 The one full hour is at your disposal to maximize your experience with gorillas as you them forage, play, socialize and also gaze at you in a sign of welcoming and saying good bye. The experience is rewarding and worthy undertaking. Your picnic lunch will take you through the activity after which you will descend to the lodge for short relaxation after which you will embark on 53km transfer to Mgahinga Gorilla National Park passing by Mutanda Lake for rewarding scenic views of this lava dammed lake. You will arrive in the evening for overnight. Accommodation: Volcanoes Mount Gahinga Lodge (Upmarket/luxury), Mgahinga safari lodge (Midrange/standard) or Amajambere iwacu camp (Budget/basic). 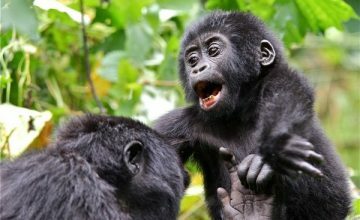 Day 13 of 18 Days Gorilla Trekking Safari & Wildlife: Do Volcano climbing or do golden monkey tracking. By this time, you will have made up your mind about which volcano to climb. Options range from 3,474m Mt. Gahinga taking 6 hours, 3,669m Mt. Sabyinyo taking 8 hours and 4,127m Mt. Muhavura going beyond 8 hours. Climbing any of these is possible and they can be summited including the round trip. The highest Muhavura gives the great views of Virunga volcanoes, Lake Edward, Rwenzori peaks and the roof top views of the impenetrable forest of Bwindi. While climbing Mt. Gahinga offers chances of citing golden monkeys in the Bamboo zone of this highland. 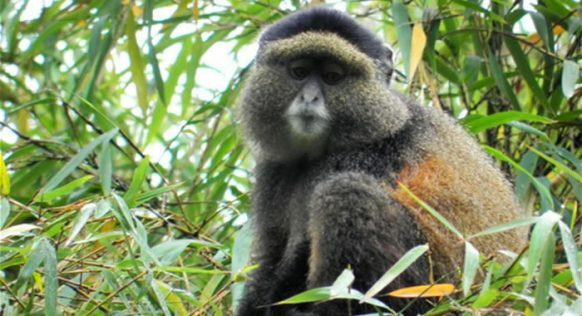 Alternatively, you can undertake the golden monkey tracking to view the rare and endangered golden monkeys which thrive only in Virunga volcanoes. It is a half day activity involving relative hikes in Mt. Gahinga with one hour encounter with them as the swing through the Bamboo stems and play hide and seek games. 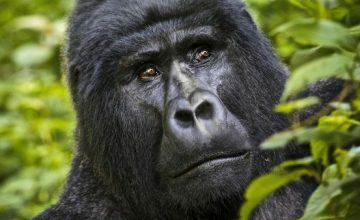 Their coat and nose structure is unique making it a product worth to visit on Uganda safari. After breakfast, set off for the Batwa heritage trail a half day activity that takes you through the forests of Mgahinga in the company of the indigenous Batwa guides as they interpret every forest landscape and what it mean tin their traditional life. The hike stretches up to the Garama cave the ancient dwelling of the Batwa – one can call it their capital in the forest of Mgahinga volcanoes. The cave is a natural shelter that always provided a refugee for the Batwa in times of danger. You will listen to the sorrowful songs being sung by the Batwa women taking you through the course of their tradition; it is a rich taste of the fading typical African culture. Return from this activity and embark on the transfer to Lake Bunyonyi for relaxation and overnight. Accommodation: Bird nest @Lake Bunyonyi resort (Upmarket/luxury), Arcadia cottages (Midrange/standard) or Byoona Amagara (Budget/basic). 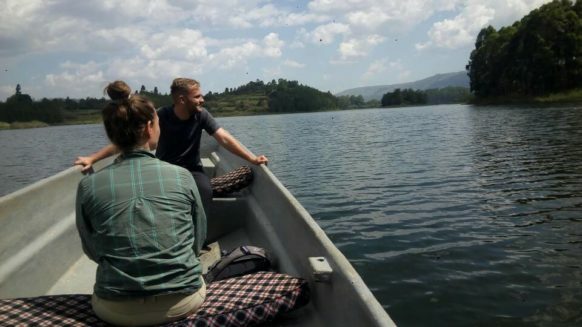 Dubbed the lake of a thousand islands, Lake Bunyonyi has a range of islands stretching up to 29 in number and can all be explored on 5 – 6 hours boat ride while on this safari in Uganda. The Lake Bunyonyi encounter is designed to maximize your relaxation and is entirely recreational. 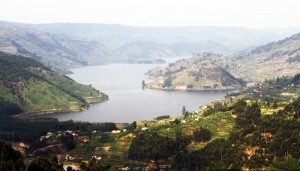 The tranquil waters of the lake and the surrounding views of Kigezi highlands dubbed the Switzerland of Africa combine to make this day a total complete experience. Options after the boat include; swimming, mountain biking, community tours and hiking. Retire for overnight. After breakfast embark on 199km journey to Lake Mburo National Park passing through the farmed hill sides of south western Uganda before making a stop at Igongo cultural center 12km past Mbarara town. You will have lunch at Igongo after which you will tour the Erijukiro cultural museum featuring the collections of all cultures of south western region. The amazing sculptures of Muguta Y’ Butaho a re-known ancient warrior and Mayenje g’ ishinjo an ancient troubled cow that caused turmoil between the Kingdom of Ankole and Buhweju will leave with a true taste of African tradition. The 1520 AD eclipse monument lies in close proximity and lives to testify the total solar eclipse that happened at that place of which by paying a visit to it, you would definitely deem to have been in existence when such wonder took place. Continue for 33km to have an overnight in Lake Mburo National Park. Wake up early for a horse back safari in the park. Options range from ½ hour to 1hour, 2 hours, 3 hours, 4 hours with picnic breakfast. You will enjoy this ride in the famous Warukiri valley in the company of well-informed guides and instructors. 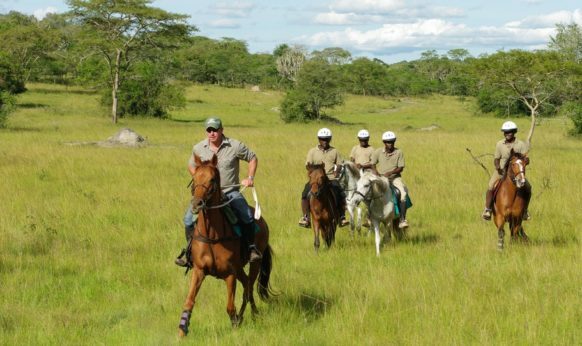 The horse ride safari offers you a great opportunity to draw closer to wild game than when in a safari vehicle. 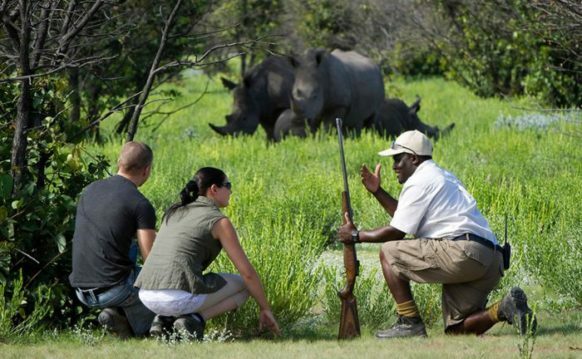 Animals like Buffaloes, Impala, Zebra, Bush bucks, Topi, Eland may be seen on this activity. Return to lodge for relaxation till lunch time. In the late afternoon, you will go a rewarding boat cruise on Lake Mburo where you will have chances to see the wild game drinking on the Lake side including the Impala and Buffaloes, birds like African fish eagle perching on overlapping trees and Hippos as they thrive in their ancient waters. 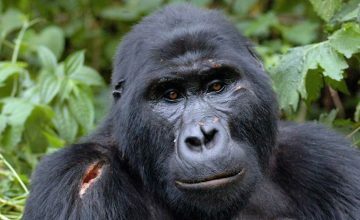 Day 18 of 18 Days Gorilla Trekking Safari & Wildlife: Do Nature walk & transfer to Kampala. After breakfast embark on the nature walk to unleash the beauty of typical savannah environment when the dew is still alive. Walk through the designated trails including hiking the Kazuma hill to gain all-round views of Lake Mburo National Park. The views of the five lakes in the area are seen, the roof top of acacia woodland that characterize the park and the multitudes of wildlife grazing in the park. Return from the activity to the lodge for simple relaxation after which you embark on the transfer to Kampala 240km about 3 – 4 hours with a stop at the equator to perform water experiments that show the divide between the north and south hemispheres if time permits.